One of the Catskill’s best home contractors is now nationally known and widely respected for his exceptional home design and building skills. Over the past few years, John Whritner and his crews have travelled the country, creating the renovations behind TV shows such as HGTV’s Cousins Undercover, Vacation House for Free, and the upcoming Kitchen Disasters. Whritner Builders served as the construction crew for the entire Season 2 of the very popular Cousins Under Cover, building and renovating homes across the nation under the tightest imaginable deadlines. On the new series, Cousins Undercover, Anthony and John surprise local heroes with total home makeovers… but they’re not alone. For jobs of this size, the Cousins involve the entire community. Vacation House for Free is a show on HGTV wherein contractor and real estate expert Matt Blashaw helps couples own a vacation home mortgage free. Whritner Builders were called in as the construction crew for the “Catskil Mountain Home” episode during Season 2, doing a beautiful renovation of a cabin in Hunter, NY, over the course of just a few days. 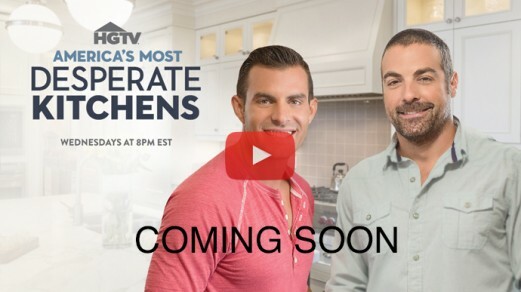 In the spring of 2016, Whritner Builders filmed an episode of America’s Most Desperate Kitchens, a new series on HGTV. The show gave John & Crew a chance to show off kitchen renovation skills honed over the last 25 year.